Here’s the T patch for Celebrate. The T has a fun modern style but still with some curves. I think it constrast nicely with the background, which is Staircase Stitch and is done in a solid color thread (Silk & Ivory) and an overdyed (flamingo Watercolours). If you wanted a less obvious contrast between the two parts of the background stitch, go with two solid colors in contrasting textures. Of course, since part of the point of this exercise is to learn about stitches, I wanted more of a contrast. This way I can go back and look at the sampler to find out how to make the stitch. 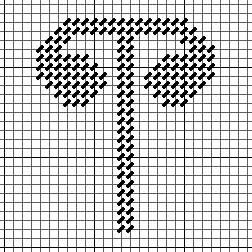 The T (click on the chart for a full-size version) is Arco 24 from Tink’s Alphabets Wild and Wonderful. It’s available in the bookstore. It’s a great alphabet, combining thin straight lines with bulbous ends to make a great look. The background stitch is Staircase, from the Stitches for Effect books. It’s a Byzantine variation, with lines of Byzantine interspaced with blocks of Tent Stitch. I made the stitch using two needles, one for each thread. I stitched a line of Byzantine, then made the squares, then stitched the next line of Byzantine. This, I think, made it easier to keep track. I think this is such a fun stitch, I plan on using it again very soon.